The benchmark for the German economy, DAX, is celebrating its birthday. 30 years ago, on 1 July 1988, DAX was first published with a starting index level of 1,163 points. Since then, DAX has been tracking the performance of the 30 largest and most liquid companies on the German stock market, reaching its all-time high of 13,559.60 points in January 2018. There are many good reasons why DAX 30 is one of the best-selling financial instruments at Admiral Markets. Choosing us, you can trade DAX CFDs 24 hours a day, five days a week, and commission-free, using the world's most popular platforms – MetaTrader 4 and MetaTrader 5. Moreover, you can boost your MT4 or MT5 trading platform with our specially developed plug-in MetaTrader Supreme Edition that brings you over 60 amazing features. 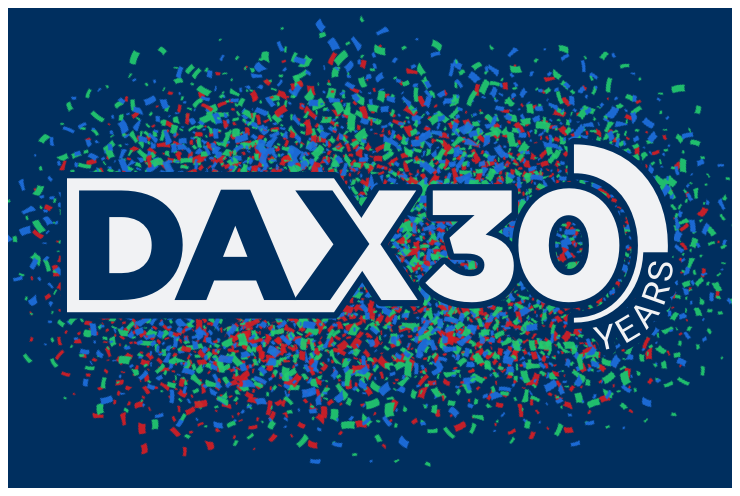 To celebrate DAX's 30th anniversary, we are offering you the opportunity to trade with our lowest ever spread of only 0.5 points, from 10:00 EET to 18:30 EET. It is no doubt the best time to start trading DAX 30 CFDs with Admiral Markets, one the most awarded Forex & CFD brokers this year. From 1 to 29 July, you will be able to benefit from the lowest spread our company has ever offered! Long & Short! Just 0.5 points spread. No commission! The DAX 30 CFD is a perfect example of how and why you can benefit from trading Forex & CFDs. Compared to stock trading, you can go long (buy) or short (sell). If your trading strategy is strong, you can make a profit, but if your're wrong, you might make a loss. The smaller the spread, the sooner you may enter the profit zone! Small spreads are essential, especially for short-term trading, like scalping. If you are new to DAX 30, you may be interested in our brief introduction to this popular index. To learn more about trading and get your questions answered, we encourage you to visit our insightful Education section with a rich collection of articles, educational videos, and webinars.